A week ago all the residents in Printer’s Row recieved notice of an extensive helicopter lift operation taking place in the neighborhood. Four new pieces of HVAC equipment were to be lifted to the roofs of the Printer’s Square towers on Federal Street and the old equipment lifted down and hauled away. While the rest of Chicago enjoyed an extra hour of sleep due to the end of daylight saving time, Printer’s Row had street closures and low-flying aircraft as our makeshift alarm clock. I grabbed the camera and headed out into the chill morning to get some photographs. I’ve seen several helicopter lifts, but none ever this close. Some of the most memorable were the various lifts to place new antennas on the top of the Sears Tower several years back. As you might imagine, the lift attracted quite a bit of attention, and there were a number of amateur photographers out taking pictures — and then quite a few more people obliviously trying to make their way down Dearborn to get a cup of coffee. Chicago police were vigilant in keeping sleepy pedestrians out of harm’s way. The helicopter was flying as low as 100 feet above the street right next to the 22-story Transportation Building. Exciting stuff. Unfortunately, the lift ended a little over halfway through the projected process. The final two pieces turned out to be too heavy for the helicopter and the task was cut short. 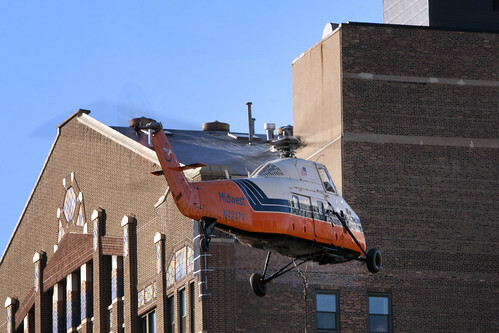 Midwest Helicopter succeeded in raising two of the four HVAC pieces to the roof and lowering three of the old pieces down to the awaiting flatbed trucks.